You can find French Beaches on the Mediterranean, the Atlantic and the English Channel. In fact, the French beach is considered the best in Europe. Along the southern coast of France lies the Mediterranean. These beaches in France are the warmest and the most expensive. French Riviera beaches to the east are the chicest of the group, this area attracts jet setters and the wealthy with yachts, etc. Leaving the Riviera, along the coast to the west of the Rhone starts the province of Languedoc Roussillon. France beaches in this part of the south have beautiful sand. Some people prefer a Languedoc Roussillon vacation over the more crowded French Riviera Beach area in Provence. 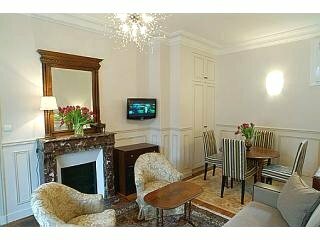 This area starts around the beautiful fishing village of Cassis with its white cliffs, casino and hidden creeks nearby. This little fishing port has retained its charm and kept overdevelopment out. It still looks almost the same as when the famous French painters Dufy, Signac and Derain were painting here. 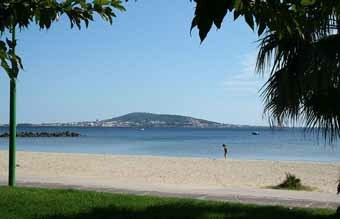 Plage de la Grand Mer is the main beach with other beaches within walking distance to town. Stes Maries de la Mer is in the Camargue near the Camargue Nature Preserve. 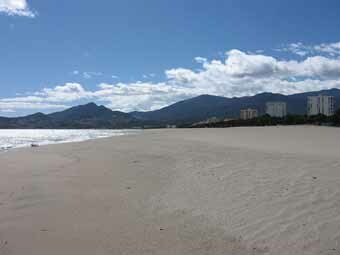 White sandy beaches and even a naturist beach 4 miles outside town. Horse back riding is available as this area is famous for its horses. 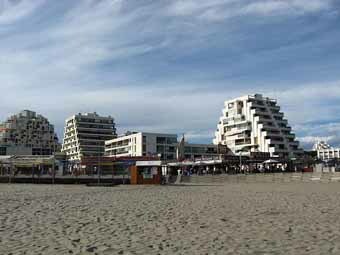 La Grande Motte is a huge modern French beach resort offering great sport activity. Water sports, golf, tennis, and 10 miles of nature hiking trails. This seaside town is south of Montpellier. Sandy beaches and pine forests. Near enough to the Camarague nature preserve for day trips. Sète is a cute fishing village. 9.5 mi (15 km) of unspoiled sandy beaches. Not crowded even in high summer. Beaches on the sea and the lagoon. The village offers museums, and historic buildings for off the beach sightseeing. 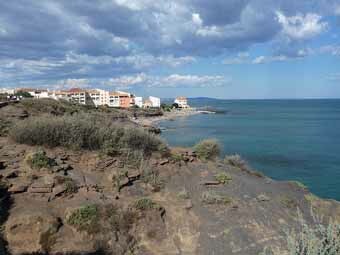 Cap d’Agde is a modern resort with long, golden sandy beaches. Offers all kinds of sports facilities. It has Europe’s largest naturist resort (20,000 visitors). Argelès sur Mer is a great beach. Very relaxing, has a cute downtown with cafes and shops. Its long stretch of beach is on the Cote Vermeille (the red coast). A short drive to Spain. The Languedoc Roussillon wine region goes all the way to the coast and fun to explore. Just a short drive into one of the major French wine regions. Where to stay? Try camping France in Languedoc Roussillon on or near the beach. Camping in france at 5 star French campgrounds are like resorts or camp rough under the stars. 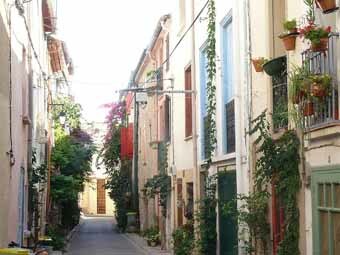 Luxury villas Languedoc Roussillon or Languedoc Roussillon vacation rentals can be less expensive than staying at a hotel Here is a self catering France guide to get you started. Flying to France? Airports in France that serve this Region.